According to the Kyōhō Meibutsu Chō, the blade went then from Nobunaga to Hideyoshi and from the latter to Kuroda Nagamasa (黒田長政, 1568-1623), but this history of the sword is wrong. In the chronicles of the Kuroda family we read that Nobunaga imprisoned the traitor Araki Murashige (荒木村重, 1535-1586) in Tenshō seven (天正, 1579), and mistakenly assumed, that also his Nagamasa´s father Kuroda Yoshitaka (黒田孝高, 1546-1604) was involved. He took hostage Yoshitaka´s son Nagamasa – then called Kichibei (吉兵衛) – and ordered his execution. The complot could be clarified and Nagamasa escaped the execution by a hair´s breadth. As compensation for the “mistake,” Nobunaga presented the Heshikiri-Hasebe to Kuroda Yoshitaka. That means Hideyoshi was not involved as it was stated by the Kyōhō Meibutsu Chō. Noteworthy is also the mounting of the Heshikiri-Hasebe (see picture below). The scabbard (saya, 鞘) is covered on the lower two thirds with a very evenly noduled, gilded rayskin (same, 鮫), an interpretation which is called kin-arare (金霰, lit. “gold hail”). The hilt is covered with a red lacquered same and wrapped with brown leather. The pommel (kashira, 頭) is of gold and shows carvings of waves. The iron tsuba is a work of one of the most famous tsuba artists ever, Nobuie (信家), and bears his signature. The hilt collar (fuchi, 縁) bears the signature “Ichijōsai Mōri Mitsunori” (一乗斉毛利光則). Mitsunori was active around Bunka (文化, 1804-1818) and Bunsei (文政, 1818-1830), and this is also the production time of the entire mounting. Interestingly, this koshirae is an exact copy of another mounting which was also in the possession of Kuroda Yoshitaka (see picture below). The mounting belongs to a blade called Ataki-kiri (安宅切) with which Yoshitaka killed Ataki Takayasu (安宅貴康, ?-1581) in the course of Hideyoshi´s attack an Yura Castle (由良城) on the island of Awaji (淡路) in Tenshō nine (1581). The blade itself (see picture below) is not a masterwork but comes from the manufactory of Bizen Sukesada (祐定) which produced blades in great quantities (so-called kazuuchi-mono, 数打ち物) during the unstable Sengoku period. That means it was a sheer war sword for Yoshitaka, the splendid mounting was made only after the glorious victory over. That the mounting was made later than the actual battle is also confirmed by the signature of the blade collar (habaki, 鎺) which reads “Koban Myōju” (小判明寿). The signature namely goes back to the famous swordsmith and tsuba artist Umetada Myōju (埋忠明寿, 1558-1631), who used the name Myōju not before the third year of Keichō (1598). Before he was called Muneyoshi (宗吉). The mounting and the blade are designated jūyō-bunkazai. Mounting of the Ataki-kiri bottom, those of the Heshikiri-Hasebe above. Except for the tsuba, the copy is very close to the original. The signature of the blade reads “Bishū Osafune Sukesada – Eishō yonnen hachigatsu-hi” (備州長船祐定・永正二二年八月日, “a day in the eighth month of the fourth year of Eishō ”). The nickname and the way Yoshitaka killed Takayasu were later added in gold: “Ataki-kiri wakige otoshi” (あたき切脇毛落, “Ataki-kiri – straight through the armpit”). Both swords, the Heshikiri-Hasebe and the Ataki-kiri, are today preserved in the Fukuoka Municipal Museum. Let´s go back briefly to the Heshikiri-Hasebe, because the blade is a good example about the influence of Masamune on his students and later generations of swordsmiths. 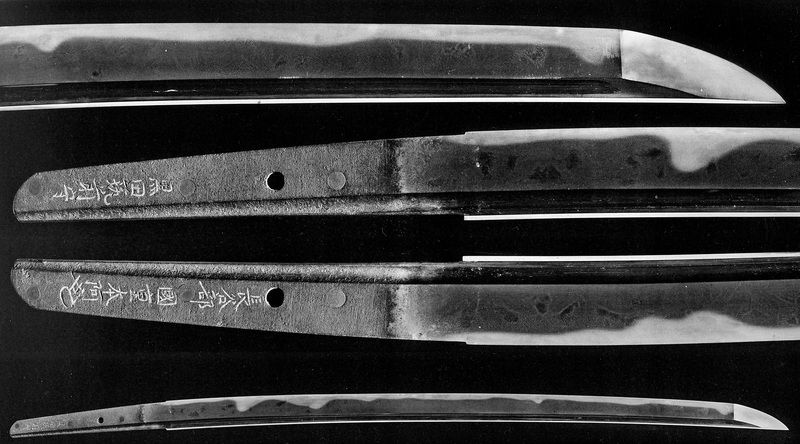 The picture below shows three blades, atop the Heshikiri-Hasebe, in the middle a work of Masamune, and at the bottom a blade of Horikawa Kunihiro (堀川国広). The upper two blades were largely shortened (ō-suriage). The Heshikiri-Hasebe measures in its nagasa 64.8 cm, the Masamune only 57.5 cm, and the blade of Kunihiro 65,8 cm. Please note the large tip which is typical for the Nanbokuchō period, along with a thin kasane, a broad cutting plane in comparison to the overall width (mihaba), only a little tapering, and a shallow sori. Simply stated, this robust blade shape developed after the second invasion of the Mongols in 1288 and the changes in warfare. Most of the original blades measures more than 75 cm but were later shortened to katana length. It is of interest that swordsmiths of the late Momoyama period copied these Nanbokuchō-period swords, but in their already shortened condition. Three blades compared to each other. This is related to the fact that many of the Momoyama- and early Edo-period daimyō and sword owners ordered a shorting, at the one hand to correspond to the then “sword fashion,” and at the other hand to meet the requirements of the newly issued length specifications for swords. Most of those ō-suriage shortenings were carried out throughout the Keichō era (慶長, 1596-1615) by the families of the Hon´ami or Umetada – at least when it comes to first-class blades. As mentioned in footnote 1 along this story), this period meant also the transition from the “Old Sword” (kotō, 古刀) to the “New Sword”. And smiths like Kunihiro tended to follow the then market condition: In demand were broad blades in Nanbokuchō style with a moderate length to mount them as katana. *1 Yoshitaka is often only referred to with his priest name Josui (如水). He once convered around Tenshō eleven and thirteen (1583-1585) to Christianity. His Christian name was Don Simeão (jap. Don Shimeon, ドン・シメオン). When Hideyoshi ordered shortly later in Tenshō 15 (1587) the expulsion of all missionaries and ordered all his samurai renounce their new belief, Yoshitaka entered Buddhist priesthood and called himself Josui. Pingback: Learn about Japanese History through Anime Swords!